GOTHENBURG, Sweden, November 27, 2017 (ENS) – Within a very few years, when you call for an Uber ride, a self-driving vehicle will show up at your door. Volvo Cars has signed a framework agreement with the ride sharing company to sell Uber tens of thousands of autonomous driving compatible base vehicles between 2019 and 2021. “The automotive industry is being disrupted by technology and Volvo Cars chooses to be an active part of that disruption,” said Håkan Samuelsson, Volvo Cars president and chief executive. The base vehicles are developed on Volvo Cars’ modular, Scalable Product Architecture, SPA. With the SPA platform, Volvo can scale production up from a sedan, to a wagon, to an SUV. Created in-house, SPA now is used on Volvo Cars’ top-of-the-line 90 series cars as well as on the new XC60 midsize SUV. The SPA platform was first introduced on the second-generation XC90 SUV, and the S90 sedan uses the same basic SPA platform. The single platform makes R&D faster and more efficient. Assembly line production can be easily changed between models as the underlying architecture and many of the parts are the same. 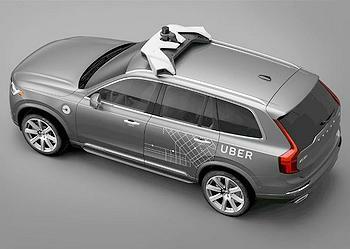 Volvo engineers have worked closely together with engineers from Uber to develop the XC90 premium SUVs that will be supplied to Uber. The base vehicles incorporate all necessary safety, redundancy and core autonomous driving technologies that are required for Uber to add its own self-driving technology to the vehicles. At the same time as providing Uber with autonomous driving compatible cars, Volvo will use the same base vehicle in the development of its own independent autonomous car strategy. Volvo plans to release its first fully autonomous car in 2021. Volvo has been in operation since 1927. Volvo Cars formed part of the Swedish Volvo Group until 1999, when the company was bought by Ford Motor Company of the United States. In 2010, Volvo Cars was acquired by Geely Holding of China. As of December 2016, Volvo Cars had over 31,000 employees worldwide and sold 534,332 cars in 2016 in about 100 countries. Volvo Cars head office, product development, marketing and administration are mainly located in Gothenburg, Sweden. Volvo Cars head office for China is located in Shanghai. The company’s main car production plants are located in Gothenburg, Ghent, Belgium; as well as Chengdu and Daqing, China, while engines are manufactured in Skövde, Sweden) and Zhangjiakou, China and body components in Olofström, Sweden.